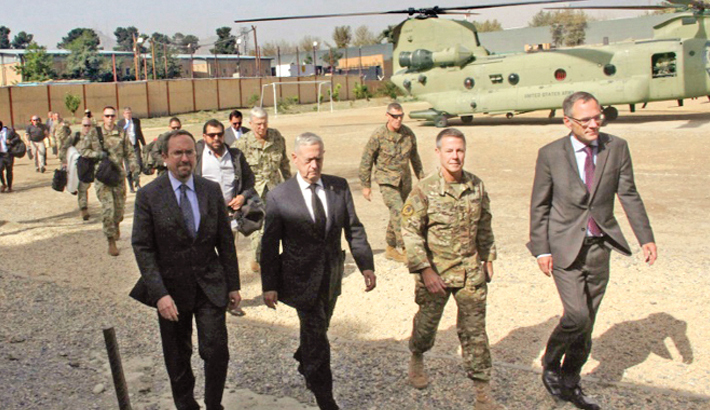 Kabul: US Defense Secretary Jim Mattis met with top Afghan leaders during an unannounced visit to Kabul on Friday, adding his weight to a flurry of diplomatic efforts to bring the Taliban to the negotiating table, reports AFP. There’s “still hard fighting, but right now we have more indications that reconciliation is... no longer just a mirage”, he said, adding that Afghan security forces were now taking the fight to the enemy. But his positive outlook belied recent setbacks on the battlefield, including last month’s extraordinary raid by the Taliban on the provincial capital of Ghazni—just a two-hour drive from Kabul.